It's a parade, a march, even a stampede, as dinosaurs stomp across the pages, in clusters and squads, huddles and piles, What's going on here? What is going on is a jolly lesson in comparison, one of those concepts that preschoolers need to master, and these fanciful dinosaurs arrange themselves into groups for that purpose. Three dinos become a tall squad, the opposite of a pile of short, sleeping dinos. Some dinos climb, while some slide down. Slow dinosaurs plod along, Fast dinos pass in a flurry of blurry speed. 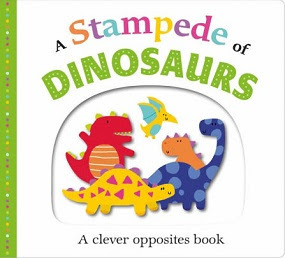 Picture Fit Board Books: A Stampede of Dinosaurs: An Opposites Book (Priddy Books/St. Martin's Press, 2017) has a lot going on in pursuit of the vocabulary to describe the concept of opposites. In addition to the usual terms like big and small, new words such as cluster and huddle are also introduced visually, as well as concrete matches that come in the raised figures of each different group of dinosaurs which just happen to fit into niches in their opposing pages. This tactile-stimulating board book with some enticing characters intends to teach an abstraction, the mental concept of opposites which depends on recognizing salient differences, one way humans frame the way they see their world. This little board book can help with the process. It seems that love for the newborn child is forever, as if everything that has gone before in a parent's life has led to this moment. 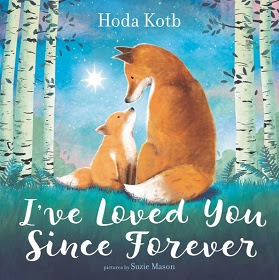 Hoda Kotb's sweet little letter to her new child, I've Loved You Since Forever (Harper, 2018), captures that real feeling that love is eternal. Kotb's text is lyrical, ascribing that love to a time before the first dawn, the first sunrise, sunset, twilight and starry sky. In that effort the author owes much to artist Suzie Mason's elegantly tender illustrations of animal mother and child pairs, set forth in varied habitats, with a backdrop of dawn and daylight, dusk and dark, in sunshine, shadow, and a night sky lit by stars. Birds and bees, elephant mother and child linking trunks, an otter mom floating with her pup on her chest, a deer and spotted fawn curled up together, all seem part of that timeless love, and Mason's soft and delicate images are delicately evocative of that devotion. And you and I turned into WE. "A bighearted celebration of new motherhood that may especially appeal to families with adopted children," opines Publishers Weekly. Had a big photo shoot. Pig the pugnacious pug and his timid housemate, Trevor the dachshund, are back! Pig the Pug is just as obnoxious as ever as he pencils himself for all the sittings on the photographer's call sheet. But even the timorous Trevor gets into the spirit of the glamour shots as he giggles at himself dressed as Elvis Prestley. But Pig the Pug pushes Trevor aside and mounts the pedestal as the King of Rock 'n' Roll. He hogs all the costumes, posing as the Mona Lisa in Renaissance gown, Tarzan in a leopard skin loincloth, Madonna in her metallic bustier, and in burly rapper gear, and insults little Trevor, calling him sausage, salami, and frankfurter! Yes, Pig ruled the photos. I'm IN, and you're NOT!" But playing to his strength, Trevor turns the tables and dons a hot dog costume. That changed the whole shoot. As always, author-illustrator Aaron Blabey celebrates the triumph of the underdog, in his latest, Pig the Star (Pig the Pug) (Scholastic Press, 2018). 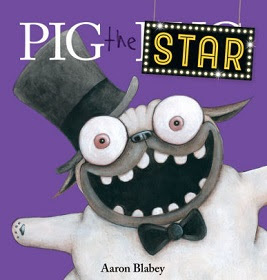 Trevor has his moment in the limelight, and Pig the would-be star falls from fame, in another delightful revenge of the nerd doggy tale by Aussie author Blabey. In this just-published sequel in his doggy series, Blabey's rhyming quatrains tickle young readers' funnybones, and his over-the-top illustrations of the predictable bug-eyed bully Pig the Pug do not disappoint! TODAY YOU CAN SEE DINOSAUR BONES AT A MUSEUM. DINOSAUR BONES ARE FOUND BY PALEONTOLOGISTS, WHO FIT THEM BACK TOGETHER LIKE PUZZLES. Although Jill McDonald's brand-new little book, Hello, World! Dinosaurs (Doubleday and Company, 2018), has all the exterior hallmarks of a tiny tyke board book, the text of the first page, with words like museum and paleontologists, shows that this is not your average baby book. It's actually an introduction to the science of dinosaurs for older preschoolers and early primary students who have already been bitten by dinosaur mania. McDonald introduces the scientific name of the better-known dinos--apatosaurus, compsognathus, triceratops, ankylosaurus, stegosaurus, iguanodon, velociraptor, and, of course, that ever-popular bad boy, tyrannosaurus rex. McDonald points out the meanings of the Latinate names and goes into the diets of these dinosaurs as either carnivorous or herbivorous, as well as descriptions of prominent physical characteristics such as apatosaurus' long neck, T. rex's two short front legs, or triceratops' three-horned face. This one is for youngsters in transition who are ready and able to acquire some official vocabulary, and as most parents of preschool paleontologists can testify, they love to reel off those long names with expertise. 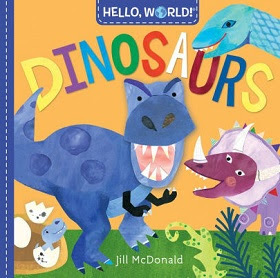 This entry from the popular Hello, World board book series is a great book for animal lovers, especially those of the prehistoric creature persuasion, and is an inexpensive way to prime preschoolers for a visit to a natural history museum. For more realistic illustrations of these popular dinosaurs, share this one with Roxie Munro's Inside-Outside Dinosaurs (see review here). BLIP liked being plugged into her computer. Blip is a cute little cyborg who is addicted to screens. She's plugged in--all the time. Wow! There's bright light coming from the sky! There are all kinds of green things and strange beings out there! Who knew? Blip learned many things, played fun games, and visited faraway places. 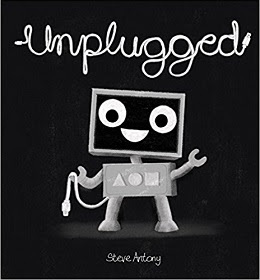 There's a whole big world out there, and it's way too big to fit on any screen, in Steve Anthony's newest, Unplugged (Scholastic Press, 2018), which encouraged preschoolers to get out and get under the sun and moon, leaving their devices behind for animals, trees, and the rest of the big world beyond. Steve Anthony is the noted author of Please, Mr. Panda (A Board Book), Thank You, Mr. Panda, and I'll Wait, Mr. Panda , (see reviews here) and forthcoming this summer, Good Night, Mr. Panda all editions in his delightful toddler etiquette series. By the front door... there's an umbrella. It's BIG. When April showers come your way... whatcha gonna do? Grab an umbrella! That's just what this girl does. She's wearing her yellow slicker and green galoshes, but it's a heavy downpour and she needs a big umbrella. But this is not your ordinary umbrella. 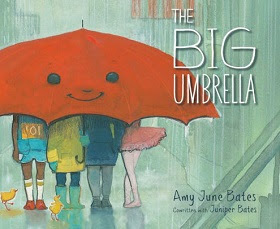 It's a big umbrella in the usual sense, but it's also the metaphoric big umbrella," capable of extending its coverage to the many and diverse people our girl meets as she walks through the town. It likes to spread its arms wide. It loves to gather people in. Some people worry that there won't be enough room under the big umbrella. A secret dream takes midnight flight. "What is it we wish tonight?" Down on earth, beside a lighted window, a little raccoon pens a letter with a special wish. The letter is folded into a paper airplane, a missive with a mission, to deliver to the moon. Around him other small animals are also sending their wishes as well. 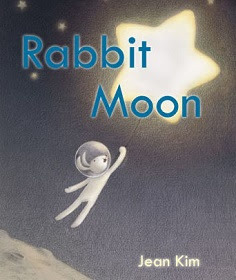 But in Jean Kim's Rabbit Moon (Arthur Levine/Scholastic Books, 2018), unlike our man in the moon, there is a Korean moon with a rabbit instead instead of a man on the moon, and this rabbit holds a magical mortar and pestle with which he grinds the wishes into the stars which float freely into their place in the firmament. But the rabbit in the moon has a wish, too. He wishes to join the young animals down on the earth, so he chooses a large star and uses it as a magical parachute with which he floats gently down to join them, where he gets a warm welcome and joins them in their daytime fun. But alas, when the time of the dark of the moon is near, the Moon Rabbit has to take action! Rabbit knows what must be done. But Rabbit knows what his new friends would wish and leaves behind something new--a telescope, so that his friends can keep in touch. Jean Kim's lovely pictures are filled with gentle animals and swirling stardust which glows magically in the deep blue sky. This is a fanciful bedtime story with its own fantasy rooted in Korean folklore, an intriguing alternate take on a magical moon, done up in simple, soothing language and lovely luminous and radiant illustrations. "Kim's scenes are drawn in pencil and then digitally colored, and they have a softness around the edges, establishing a cozy mood that is sustained by the gentle rhymes," says Kirkus Reviews. Taylor's tower has six stories! It's terrific! It's his triumphant tour de force, his piece de resistance, his magnum opus! And then a small flock of bad birds knock it down. It's unforeseen! It's unfortunate! It's unfair! Taylor huddles in a puddle of sadness. THE CHICKEN WAS THE FIRST TO NOTICE. She clucked a sympathetic invitation to talk about it, but Taylor didn't feel like chatting with Chicken. The Elephant advised that entertaining happy memories of his tower would make Taylor feel better. Taylor sadly didn't go for either suggestion. Snake advocates transferring his feelings to someone else. Misery may love company, but Taylor didn't want pass his pain along to someone else, either. None of his animals offered what he needed--except Rabbit. TAYLOR DIDN'T NOTICE THE RABBIT. BUT IT MOVED CLOSER AND CLOSER. 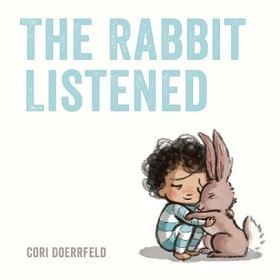 Sometimes all a kid needs is sympathetic silence and a quiet cuddle, in Cori Doerrfeld's The Rabbit Listened (Dial Books, 2018). Author Doerrfeld's text slyly allows Taylor the chance to reject a lot of ways to handle loss, and artist Doerrfeld's endearing and poignant illustrations are both simple and yet skillfully nuanced. For a sweet rabbit story that has nothing to do with sweet treats for Easter, this one is a choice choice. As Publishers Weekly puts it, "Each of Doerrfeld’s highly distilled and elegantly concise vignettes brims with emotional honesty and profound empathy. The result is a story that’s wise, funny, and easy to take to heart." ... there's nobunny like Nicholas, the little cottontail rabbit created by the venerable Richard Scarry, who happily shares his world with kids. Nicholas lives in a hollow tree, shelters from the rain under a giant toadstool, and likes to show off his woodsy home. He likes to watch bluebirds fly over, pick daffodils, chase after all kinds of butterflies, and he knows just when the dandelions seeds are ready to take flight with a big bunny blow! 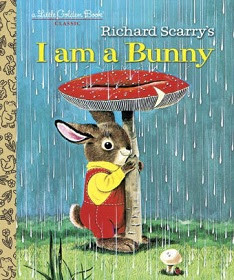 In this sturdy edition of Richard Scarry's and Ole Risom's I Am a Bunny (A Golden Sturdy Book) (Little Golden Books), Nicholas delivers no baskets of eggs and goodies, but he does take bunny lovers along on a tour through his woodland home to see all the sights of spring--and other seasons, too. In this one, Richard Scarry's familiar style, with his careful draftsmanship and big-eyed, anthropomorphic little bunny in overalls has all its charms intact. It's a classic that never goes out of style. Rot is an, um, "mutant" potato. He's actually a bit, er, rotten here and there, and not really handsome, even as overripe veggies go, with a unibrow, one eye that seems a bit moldy, and something strange sorta sprouting from the top of his head. --Rot is on it like mold on bleu cheese. He feels like a sure winner--that is, until he spots the competition. And an eenie-weenie, pink and peppy, jolly jellyfish. The other contestants find Rot a little nauseating, while ROT wonders if they wouldn't be toothsome treats! But he rethinks the idea and decides that eating the competition wouldn't help his chances to win. Instead, he decides a little self-cute-ification might be expedient. He tries fake blue bunny ears, cutesy kitty whiskers, and paints himself jellyfish pink sporting a pink tutu and pom-poms. "Look!" says Rot. "I look like you!" The other contestants take the stage, sure their cuteness will charm the judges. Rot does his best to strut his stuff, even his spotty backside. But, WAIT! This contest is crooked! The judges are all rotten--a bad lot! A Blighted Banana, a Wormy Apple, and a Past-Prime Pear? 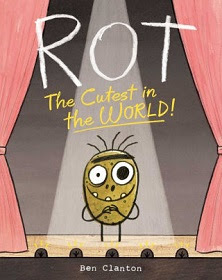 Beauty is in the eye of the beholder, in Ben Clanton's clever parody of beauty pageants, Rot, the Cutest in the World! (Atheneum Books, 2017). in which Rot takes the trophy, while the runner-up pink jellyfish tries to vary his look with his own unibrow. Young readers will find Rot irresistibly ticklebox-worthy in author Clanton's tongue-in-cheek text, and artist Clanton uses the faux naif style to great effect with his simple blackline drawings illustrated in blotchy daubs of watercolor that subtly spoof the zombie craze. Rot is NOT pretty, but he is what he is, himself to the core! Says School Library Journal, "An entertaining and irreverent take on self-confidence." Sleeping in a giant nest in a tree? Playing all day in the woods? Literally hanging out all the time with your best friends? What kid wouldn't go for that? What if you wished you were a gorilla? Then you became a young gorilla? Could you eat like a gorilla? Live in a gorilla family? Young beginning readers get to try out their inner ape in Harper's new Ranger Rick: I Wish I Was a Gorilla (I Can Read Level 1) (Harper, 2018). Author Jennifer Bove' takes would-be young gorillas through their day as a member of a gorilla troop--taking a ride on their mother's back, being protected by the the troop's Big Kahuna, the senior silverback, searching for sweet juicy fruits in the treetops, and playing with their friends all day long. Gorilla School is way cool. How would you learn to be a gorilla? Babies play a lot. Playing helps young gorillas learn to move like grown-up gorillas who roam around and climb trees. Wrestling and chasing one another and playing games teaches them how to get along with other gorillas. Of course, there's more than fun and games to being a gorilla, and little ones have much to learn from each other and from their elders--what foods are best to eat and where to find them and what predators are dangerous and how to avoid them. That's not always easy, and gorilla troops have to stay on the move to find new foraging places. It takes a lot of food to feed a troop, and the elders must teach the younger ones how to look out for themselves and each other. It's a jungle out there, you know. Author Jennifer Bove's easy-reading text offers lots of gorilla lore for primary nature lovers as she takes them through a day of being a gorilla. Big color photographs document life among these largest of primates as they care for each other, forage for food, play and socialize, and chill out together, with emphasis on the fun young gorillas clearly share with each other. Being a gorilla could be cool for a while. But would you want to talk in grunts? Or eat plants and bugs? In her appendix author Bove' also adds an collection of fun facts, "Did You Know?" a "Fun Zone" with recipes for gorilla cuisine such as "Ants on a Stick," and a glossary titled "Wild Words," that lends itself to classroom nature science studies. 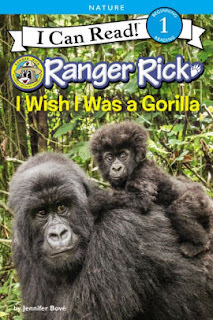 And if gorilla life is a bit too plant-based for some, other books by noted nature authors in the series include Ranger Rick: I Wish I Was a Lion (I Can Read Level 1) and Ranger Rick: I Wish I Was an Orca (I Can Read Level 1). IT MADE HIM HAPPIER THAN BIRTHDAY CAKE. In spring a young man's fancy may turn to thoughts of love, but Bagel just wants to dance--and that requires a partner. Poppy Seed Roll is the peppiest bread in the basket, but she turns him down flatter than a fritter. Pretzel crisply declines the honor, rating Bagel's footwork as downright cheesy. Donut's eyes appear to grow glazed at the idea of dancing with Bagel. Matzo turns him down flat. Croissant just rolls her eyes. "ARE YOU TRYING TO BUTTER US UP?" SHE ASKS. But Bagel roundly ignores all their denials and heads off to Sweet City to try his luck in the dance contest. He auditions with a tap dance in the style of famed film star Fred Eclair, but the French roll pronounces his routine stale. But then Bagel catches a glimpse of the sweetest pastry product of all. Cupcake accepts his invitation to the dance, and they give their steps a twirl around the dance floor. 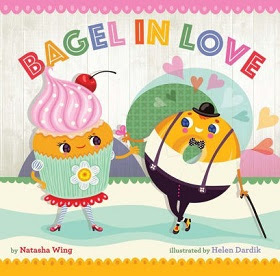 It's a match made in Bakery Heaven, in Natasha Wing's latest wordplay-filled winner, Bagel in Love (Sterling Books, 2018). Veteran author Natasha Wing, the author of the ever-popular The Night Before.... series, liberally adds a dash of freshly half-baked word wit into the recipe for this pun-filled fun read, illustrated heartily in yummy pastels with plenty of sprinkles that may leave young readers smiling but strangely craving carbs. Other satisfying rhyming stories by Natasha Wing include The Night Before St. Patrick's Day and The Night Before Easter. Little kids are learning all the time, and what time is better than Eastertide for learning the colors? Nature is switching from basic black, gray, and white to a rainbow of colors, and what better teaching experience is there than being immersed in color while dyeing Easter eggs for the Easter basket? 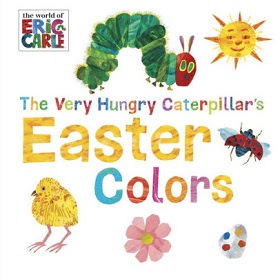 And Eric Carle and his beloved character, that hungry little caterpillar, are the perfect guides, in his board book, The Very Hungry Caterpillar's Easter Colors (The World of Eric Carle) (Grossett and Dunlap). Famed artist Carle sets the color words on each left-hand page washed with that color and its name in big, block letters, while something of that color is pictured on the facing page. Two little chicks model YELLOW, four new leaves on a twig show off the their new GREEN shapes, and who else but Carle's spotted ladybug could wear RED so well? There's a PINK flower, a BROWN bird's nest, and a woolly WHITE lamb who get the same double-paged spread, and there's a surprise on the last two pages--a Happy Easter basket showing off all the colors in its bright eggs. This jolly board book is just right for the basket, something that will be around long after the chocolate eggs are nibbled. It's a shaped story book, complete with Peter's industrious siblings, Flopsy, Mopsy, and Cottontail, busy filling their baskets, and his partner in rascally radish nibbling, cousin Benjamin Bunny. Peter ventures out into the forbidden field of Mr. McGregor's gooseberry bushes for some adventures, but returns to his home burrow when it's time to say goodnight, in this new edition of Beatrix Potter's popular bunny tale. It's a sturdy board book, a simple version of the classic story, and a crib toy, all in one, in Peter Rabbit Large Shaped Board Book (Frederic Warne, 2018 Am. ed. ), with Potter's delightful illustrations with all their soft water-colored appeal. This is one bedtime story that goes along for nighty-night time. WITH EARS THAT FLOP UP AND DOWN! Who wouldn't want one of those? 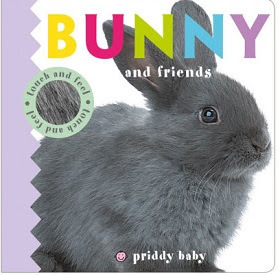 Bunnies for Easter and baskets often go together, but if you don't plan to have a hutch in your house, Roger Priddy's tactile-stimulating title, Bunny and Friends Touch and Feel (Baby Touch and Feel) (Priddy Books/St. Martin's Press, 2017), fits right into the Easter basket, with soft fur to feel and a real cotton tail to touch. Young ones are encouraged to stroke two bunnies, one with gray fur and one with brown, while a cottony little puff of a tail is there on each of them. And when little bunnies are ready for a nap, there's even a sturdy brown rabbit hutch. Is it rough, or smooth to the touch? This sturdy little board book for the youngest is a great Easter basket stuffer for the very youngest Easter Bunny fans. LOVE is all the smiles you give. Peter and Mama Rabbit count the ways of love--exploring the wide world together, and then going back home, snuggling together in their burrow. It's holding hands when lost or lonely, cuddling when it's snowy outside, that "just right" feeling when they share time and hugs and kisses, and laughs, especially at bedtime. 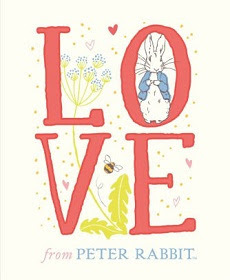 With the beloved pastel illustrations of Beatrix Potter, this little book, sturdy but petite enough for small hands, Love from Peter Rabbit (Frederick Warne, 2017), is a sweet but sugar-free treat for the Easter season, especially for the Easter basket, along with the adorable Gund Classic Beatrix Potter Peter Rabbit Stuffed Animal Plush, 6.5-Inch., for somebunny who's loved a lot. "Don't fight!" said Cas. "Can we turn the radio back on? Maybe they'll tell us help is finally coming." "With one person of interest being questioned, authorities are working to find another individual they have confirmed is involved in this terrible bombing. A source confirms that the individual is one of the students trapped on the second floor of the school. With four bombs having already gone off, there appears to be one explosive device still inside the school that could detonate at any time." Another bomb was ready to go off, and the bomber was one of them. It is the week before the new academic year begins. Six students leave their homes to go to their school, each one concealing the real personal reason to be there--from setting up a complex prank to suicide and murder. Diana knows that all her father cares about is for her to be the flawless Congressman's daughter. She was determined to prove him wrong. Rashid thinks of the looks he'd gotten at school since his beard, the one he wasn't allowed to shave off, had grown. Hitching up the bag, Rashid frowned. If he was going to change things, he had to do it today. Z's mom has died of cancer, and without money, he'd just received the letter telling him he's about to become homeless. Z grabbed his father's old army duffle. He had things to do. He was going to school, and he wasn't coming back. Frankie's sister has figured out he's pulling some big prank on the Junior Varsity guys. Frankie knows he made a mistake with Tad. But it's a mistake no one in school would ever believe about their star quarterback. Frankie adjusted the bag on his arm and pushed all thoughts of Tad to the side. It was time to finish what he'd started. Everywhere--on the football team, at school, at home, Tad is tired of pretending to be someone only he knows he can no longer be. He grabbed his gym bag. Everything was there. He was going to insist on being noticed. And it wouldn't be just his life that changed if he went through with this. Cas had thought things might be different in her new school, but they have already decided she wasn't good enough. She jammed the stupid scarf into her bag and yanked open one of the glass doors to the school. She was done with it all. Now, bruised and bleeding, some with broken bones, all six of them are trapped in a collapsing building with a raging fire spreading inside. Outside fire fighters can't enter because of the remaining bomb that may explode at any moment. They came with very different purposes, but now all but one have only one thought, to survive, and for that they need each other. 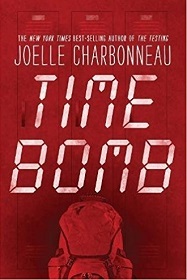 Joelle Charbonneau's forthcoming thriller, Time Bomb (Houghton Mifflin Harcourt, 2018) is a mystery thriller, a survival story as timely as yesterday's news, and a sensitive story of six teenagers at a pivotal moment in their lives, a story in which they know that, although one of them is a terrorist, they need all of them if anyone is to escape death. Noted for her trilogy, The Testing, a series of dystopian novels about a band of competitive teens who come together to save their society, author Charbonneau knows how to create believable but disparate characters whose fate depends upon their ability to meet a challenge to their survival. Introducing the protagonists in brief thumbnail chapters written in their own voices, she gradually reveals their secrets while keeping the reader guessing who the real bomber is until the ending. No one of them comes out of that building the same as they went in, in a page-turning survival story of school violence that will have readers wondering what they would do when the bombs go off. And sounds of happy play. It's a wonderful day in the neighborhood for Mr. Fish & Friends. Even Mr. Fish's pouty mouth is all smiles, and the small fry fish and their fellow crustaceans frolic in the waters of Tommy Tickle Park. In oceanic terms, all's well in the sea's swells. But then a shadow literally passes over this perfect pelagic scene. It's a.... SHARK! And growled as he swam. The small denizens of the deep dive down to the bottom. Flounder flaps until he is hidden in the sand. The rest swim for cover. No one wants to make trouble taking on Snaggletooth the Shark. Even Pout-Pout Mr. Fish suddenly feels puny. "You have broken up our fun. But it is what you've DONE!" Boys and girls, don't try this with a real shark at your beach, but Mr. Fish has a good point about facing up. 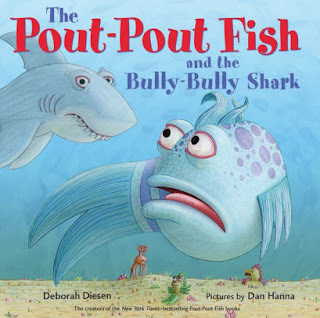 If you can't overpower a bully, maybe you can co-opt him by appealing to his better self and fitting in with the group, and in Deborah Diesen's The Pout-Pout Fish and the Bully-Bully Shark (A Pout-Pout Fish Adventure) (Farrar, Strous and Giroux, 2017) shows her hero Pout-Pout Fish converting the shark to one of the gang, one who even follows the rules: 1) BE KIND! 2) BE FAIR! 3) IF YOU SEE SOMETHING WRONG, SPEAK UP! As always, Mr. Fish learns and returns a new lesson, but it is artist Dan Hanna's detailed and delicate deep-sea illustrations that are the seaside center of attention in this latest under-the-sea adventure.